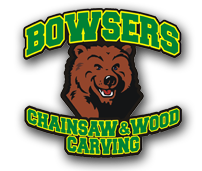 Pace often goes onsite to carve trees at a client’s location. This angel is a recently completed commissioned sculpture. These commissions can be quick chainsaw carvings, or a carving with more refinement, detailing and sanding, like the monument in progress at the Depot Museum, aka the Pottawatomie County Museum, and have several other recent pieces in Shawnee on display as well. Two views of recent commissioned piece. View of work in progress, and detail from finished piece. Pace also carves smaller commissioned pieces at his wood shop. Here is an example of a finished carving with pricing. Please use the contact tab to send questions about commissions. Cairn Terrier by Stanton Pace. Commissioned.